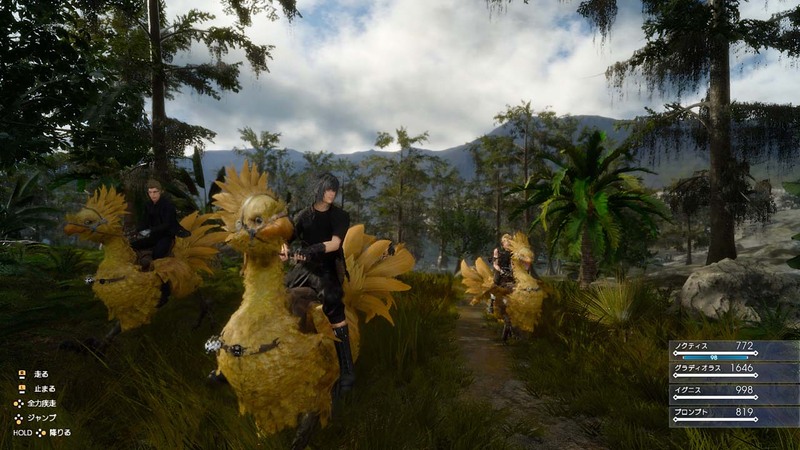 I don’t know if the opening of Final Fantasy XV is a tongue-in-cheek joke or not, but I really want to believe that it is. Our first impression of Noctis is an insufferable sarcastic teenager making jabs at his father, the king, letting the audience know our protagonist is descended from a long line of mouthy, contestable heroes (*cough* Cloud, Squall, Tidus, Vaan *cough*) that players had to endure a few hours of before the characterisation train hit them. It made sense back in the 90’s when heroes were allowed to be cool and edgy, but now it’s a bit harder to swallow; unless, of course, it's just setting the whole thing up to be a nostalgic reworking of the Final Fantasy tropes. Cut away now to the first time you get to control Noctis. The stylish black convertible, the Regalia, has broken down and you’re gonna have to push it – and the sequence lasts just long enough for the point to sink in. Overblown cinematic boss fight this is not, and if anything it’s a jab at the Final Fantasy series’ penchant for slow starts and opening sequences that can take hours. As the soft refrains of Florence Welch’s rendition of Stand By Me set in, the scene pans to the sky to reveal the game’s title. The key themes of this game by now are clear: brotherhood, coming of age, wearing lots of black clothing and doing rather mundane things in not-so-fantastical settings. Whereas the gameplay and narrative starts slow however, the characterisation is refreshingly quick. 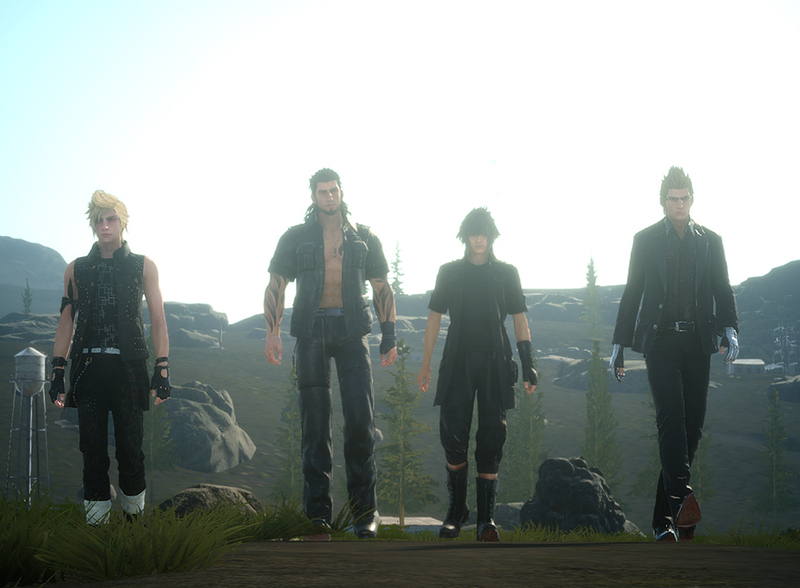 The main party of the teenage Noctis, reserved and dignified Ignis, energetic and arrogant Prompto and stoic but friendly Gladiolus is a four man band of which dreams are made of. The personalities are so different and yet by merit of fantastic writing and voice acting, the four feel like lifelong buddies and the player is invited right into the middle of this amicable road trip. The chemistry between the four leads in itself is what makes the onset of the game so engaging. Combat is built around the interplay of these four characters, and even though you’re playing as Noctis the entire time you get a feel that teamwork is necessary to succeed. Combat is, for the first time in the Final Fantasy series, completely in real time, but it’s not a button masher at all; in addition to blocks, parries and a handy warp technique, Noctis will need to call in his allies to perform special attacks to really get the edge over enemies. The AI is incredibly helpful and you’ll find yourself relying on them a lot, given that they can knock down enemies to help you deliver bonus damage, as well as revive you if you fall in battle. A standout moment for me was in an early fight where a wolf-like enemy had Noctis pinned: Gladiolus bellowed Noctis’ name with genuine concern before smashing the wolf away with his heavy sword. These AI characters will have your back all the time, and it feels like a collective victory when the four defeat a tough opponent together. The friendship between the four is also apparent outside the battlefield. After fixing the Regalia, everyone hops in and Noctis is tasked with driving to the next location. The player is bound to roads and a rather limiting speed, unfortunately, but these moments of waiting are used for voiced conversation between the party members, giving time to flesh out both the characters and the world. Upon arriving at towns, your characters will talk to each other. At campsites, they cook for each other. When making dialogue choices, Noctis can ask them for help. After playing for just a few hours, Ignis, Prompto and Gladiolus felt like old friends, with multiple dimensions to their characters. And just like that, I was hooked. I know I’ve rattled for a long time about the characters but for me (and hopefully for a lot of other players as well), that was the absolute standout of my time with Final Fantasy XV. On top of that, the battle system is great, with a slick transition into and out of combat which grades you on how well you did. The graphics are truly next-gen, with expansive environments full of areas you can actually walk to, and monsters that move just like a real life creature would. The music is gorgeous and perfectly evocative of the location. Production values are through the roof and it feels like every day of this game’s decade long development cycle contributed to a stellar final product. In terms of narrative, I think Final Fantasy XV benefits from a lack of urgency and an overall relaxed demeanour. Noctis is always surrounded by his friends and, even when tragedy hits, humour and leisure activity is used to break the tension. This is in stark contrast to XIII, which was a frantic quest and a race against time, and a narrative justification for the abhorred stretches of straight corridors. XV prefers to drop you into a hub location with tons of sidequests until you decide you want to leave, evoking a more Western style of game design which enlarges the game’s scope significantly. 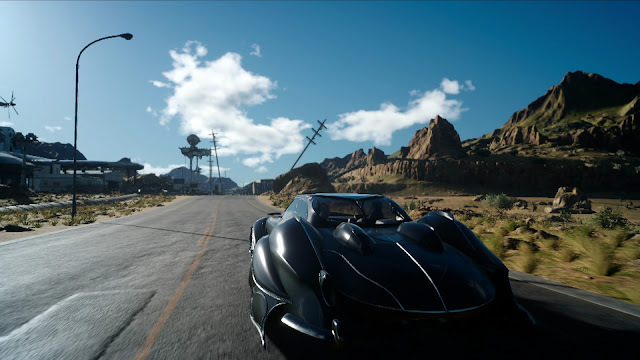 I’m sure some long time fans will find complaints, perhaps in the restricted nature of the driving mechanic, or the linear path of the story (although admittedly XV has sidequests from the get-go and feels almost MMORPG-like at times) or the strange character progression system that’s a little like X’s Sphere Grid but perhaps less interesting. The Final Fantasy series has run so long that each new title is not about filling big shoes; it’s more about choosing which shoes to fill and which ones to leave to history. Admittedly though, I do think XV has a much better shot of being the “game-for-everyone” that XIII certainly wasn’t, and arguably XII right back to VII wasn’t either. In my first few hours of Final Fantasy XV there were few complaints to be had which didn’t seem nitpicky, and I thought it had one of the strongest opening sequences for any game in recent years. It’s full of little subtle moments that catch the player off guard, and before they know it they’re ready and eager for an adventure with Noctis and company. In an industry where the single player experience has moved past game mechanics and graphics to a cohesive entertainment package, and where narrative heavy games like The Witcher 3 and Uncharted 4 tower over all else, the stage has never been more set for a main series Final Fantasy title. Argue all you want about Ivalice Alliance, the MMORPGs and Fabula Nova Crystalis, about the stagnation of the JRPG genre and the end of blockbuster Japanese games. You may or may not be right with all of that. It's going to be irrelevant to this game, though, because with Final Fantasy XV, Square Enix is likely to show the world it’s still a big contender in the international market and that Japanese games deserve every bit of the attention that the biggest blockbusters from the west enjoy.